Transform your nursery space by furnishing it in style with the Disney 4 piece Winnie The Pooh Dreams & Wishes Room Set from Obaby. With top quality materials and craftsmanship to match, the Winnie The Pooh ‘Dreams & Wishes’ Deluxe Cot Bed provides an exceptional nights sleep for your child. 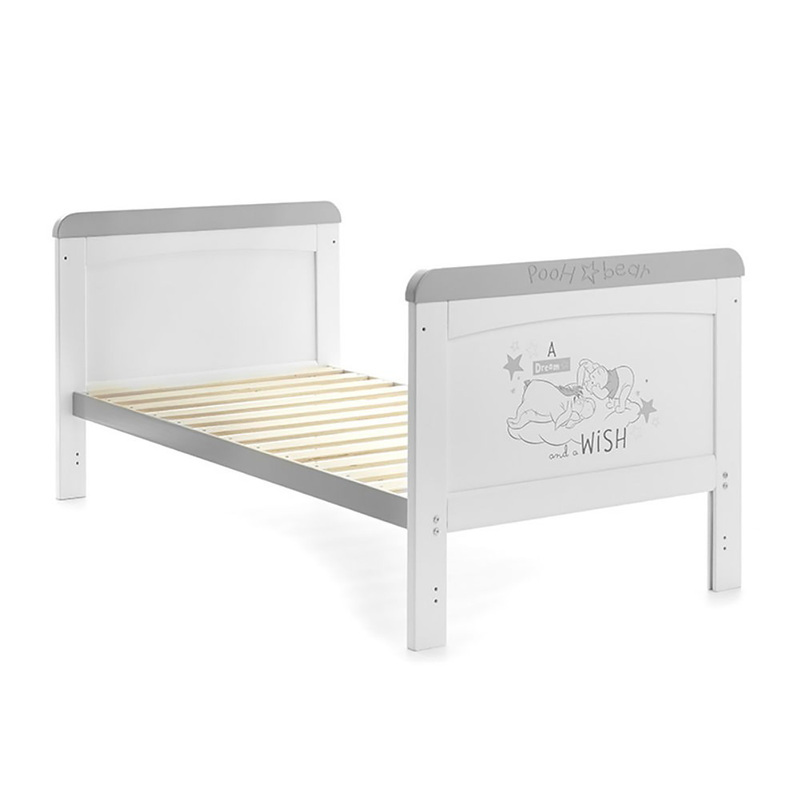 The Cot Bed is sturdy, solid and features 3 base height positions which allows the cot to adapt to the growth of your child to safely accommodate them until the age of approx 4 years old. With the inclusion of protective teething rails, your high-quality cot bed is sure to look at its best for longer and when the time is right, it easily converts to a junior bed which aids the often daunting transition between beds. 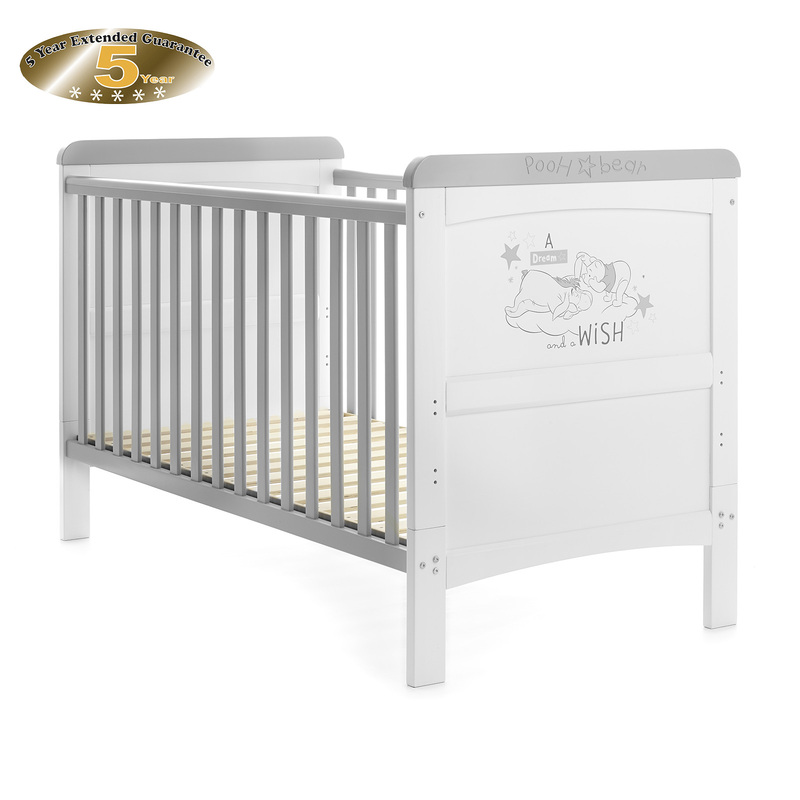 Delightful Winnie The Pooh themed illustrations and beautiful engravings have been added to provide distinctive character and charm to the cot bed itself and also the room it resides within. A true piece of Disney magic! The Under-Drawer (included) offers some much needed storage space for baby’s numerous items. 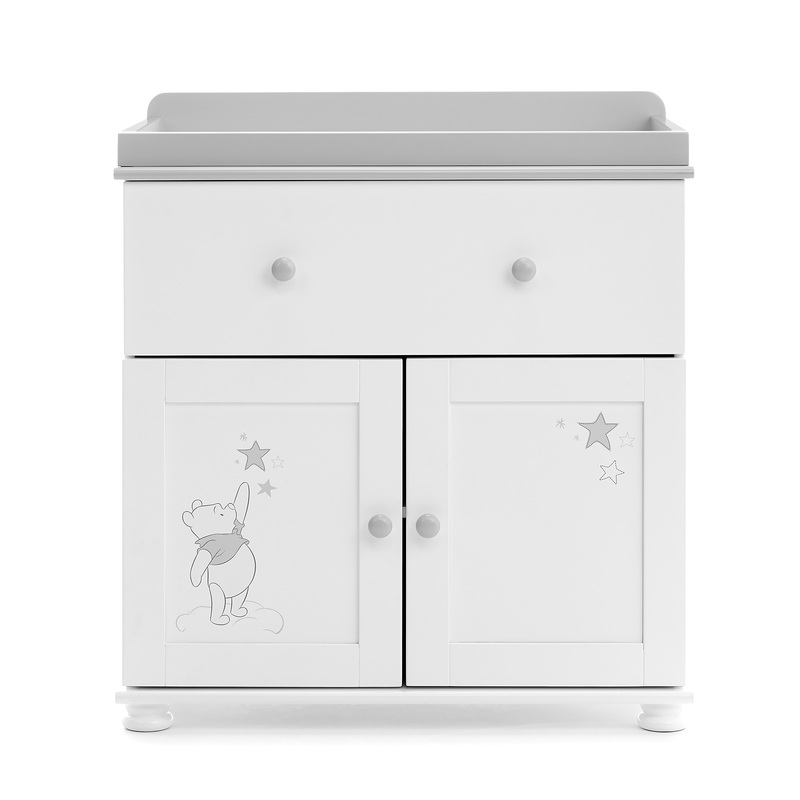 Sleek, stylish, simple to use and also adorned with Winnie The Pooh themed engravings, the drawer is mounted on castors to offer quick and easy access to baby’s stored items and features recessed handles for that timeless look. The matching Disney Winnie The Pooh themed Closed Changing Unit benefits from a strong and sturdy wooden construction which is an ideal place to change baby. Featuring a generous full length drawer and a shelved cupboard in which to store all of baby’s essentials, the changing station also comes with a cleverly modelled space on top which is ideally suited to accommodating a changing mat. Set at a comfortable and convenient height to conduct your nappy changing duties, the changer is a stylish and contemporary nursery must-have which incorporates a beautiful Pooh Dreams & Wishes design for those with a love for the magical world of Disney and the characters from the 100 Acre Wood. For a superb space-saving storage solution, the Double Wardrobe is sure to suitably satisfy your search. Comprising of 1 generously deep full length drawer and a double doored cupboard space which contains two hanging rails, the wardrobe offers plenty of space to stow away all your little one’s clothes and accessories in style. 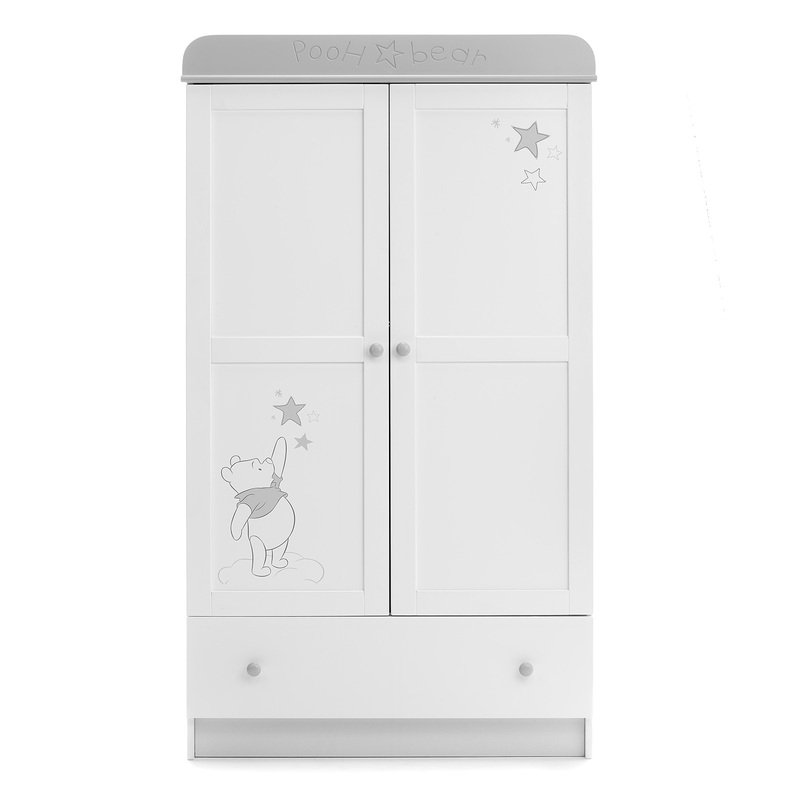 With a simple, clean and fashionable design incorporating enchanting Disney Winnie the Pooh 'Dreams & Wishes' illustrations and engravings, the wardrobe would be suitable for a wide range of tastes and is sure to co-ordinate well with already established decors and nursery themes.